Let me clear up the troublesome name of this post and product while we’re here. 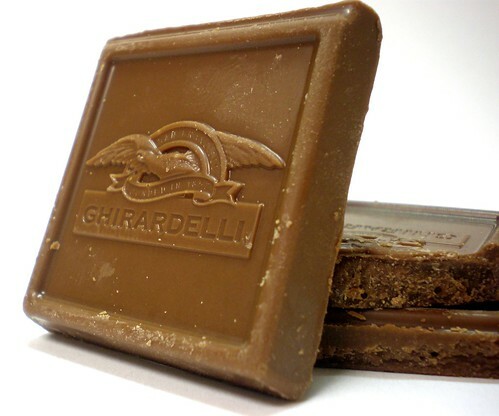 Ghirardelli is the brand. 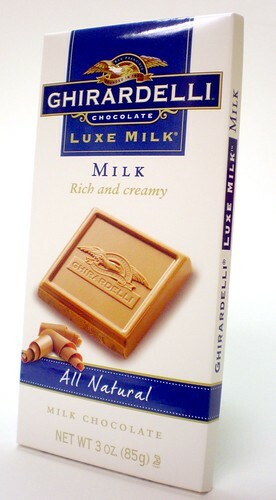 Luxe Milk is Ghirardelli’s all natural product line. And Milk is the variety (Is that the right word?). Now then. Ghirardelli chocolate always seems to be around. Someone always has a bag of those little squares lying in their cubicle, the raspberry ones waiting forlornly at the bottom as their mint and caramel brethren are swept away to the land of happy digestion. And with the holidays right around the corner, I’m sure I’ll be receiving a bag from someone who couldn’t otherwise be bothered to think of an actual gift for me. But I’ll take them happily. I live about 90 miles from Disney World and the Ghirardelli Soda Fountain & Chocolate Shop in Downtown Disney. There are few pleasures in the Disney World that rival a stroll past the shop after a long day of sweating in lines and drinking seven dollar bottled water. I love to stand in the doorway, happily blocking the Midwestern mom behind me pushing her quad stroller, and just inhale. Close your eyes and go there with me. Ahhhhh. Chocolate and waffle cones. Heavenly. Until The Mouse and his legion of servants figures out a way to measure and monetize the Disney air you breath (probably involving some type of Donald Duck bill respirator mask), this is one of the few free pleasures to enjoy while on Disney property. Or you could just shell out the $287 for a one-scoop cone (be sure to allow sufficient time to fill out their financial aid forms). So I am a fan of Ghirardelli. Who isn’t? This Luxe Milk Milk bar is one fine chocolate rectangle. It is thick and rich and sweet and smooth. The chocolate melts easily and quite deliciously in your mouth. 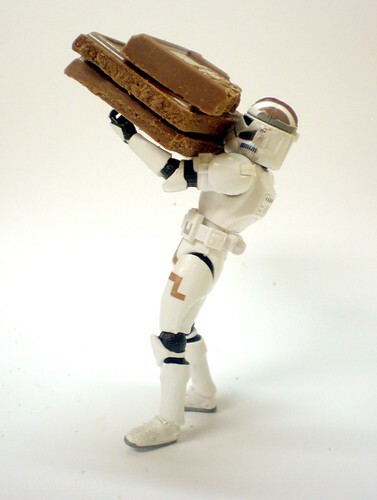 It started to melt on my fingers fairly quickly as well, when I was posing our intrepid snacktrooper. There are worse problems. Even though this is their plain milk chocolate variety, I was finding strong hints of caramel. If you closed your eyes, (I hope you opened them back from before) the sweetness and velvety density might fool you into believing you were eating something with some explicit caramel content (also the name of my rap group). I really enjoyed this chocolate and am looking forward to trying the other Luxe Milk flavors (currently there are four). Also, I’ll be at Disney World in a few weeks, so if anyone wants some of the Ghirardelli smell bottled and shipped, or some stray Lego bricks from the Lego store, or even Walt’s frozen head, let me know now, and I’ll see what I can do. Thanks for the review – I hadn’t picked up any of these bars, but have been intrigued. Since I love milk chocolates with caramel flavors, I’ll need to change that. And please, keep putting the folks with quad strollers in their place. Together, we can put them in their place.